Developers and brothers Derek and Greg Stevens have officially unveiled plans for Circa Resort & Casino, a brand-new integrated gaming resort in Downtown Las Vegas, slated to open in December 2020. A welcome addition to the iconic Fremont Street Experience, Circa will bring a new energy to Downtown as the first ground-up resort development in the area since 1980. The innovative property will celebrate the timeless spirit of the city while leading the charge for a bold new era with game-changing guest offerings. Paying homage to the city’s vibrant history, Circa will nod to the Las Vegas legends of decades past, ranging from the visionaries behind the first gambling halls on Fremont Street to the preeminent destination resorts on the Strip. To learn more about the history of the Downtown Las Vegas neighborhood and its influence on Circa, please visit Circalasvegas.com. state-of-the-art slot and table gaming options. Circa has collaborated with Steelman Partners to oversee architecture and design, Tré Builders as construction manager, and McCarthy Building Companies Inc. as contractor. nine-story garage will be the first of its kind in Downtown Las Vegas, allowing guests to conveniently and efficiently travel to and from the property. 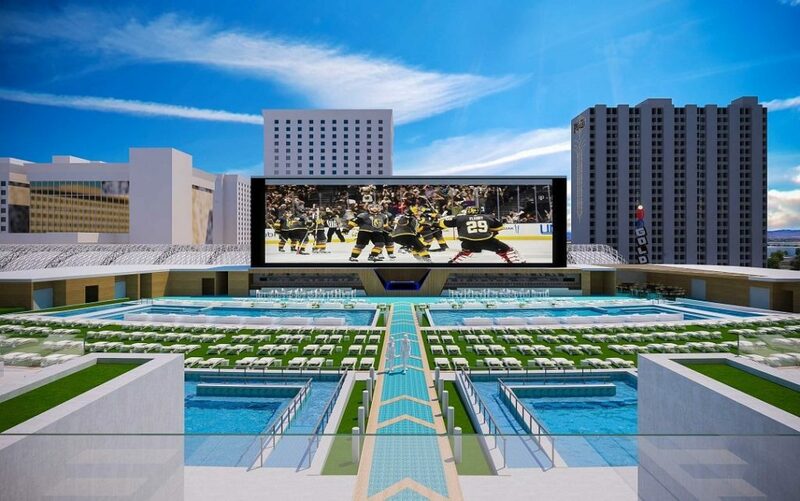 multi-level, stadium-style sportsbook, equipped with the biggest screen in sportsbook history. The Stevens brothers recently announced a partnership with sports gaming media organization Vegas Stats and Information Network (VSiN) to bring an in-house broadcast studio to Circa. This will allow bettors to have in-depth analysis from a roster of experts including broadcasters, industry professionals and athletes. watch-party atmosphere for sunseekers and sports fans. The venue will be complemented by a delicious food and beverage menu, private cabanas and music from DJs and special guests. After months of speculation, Circa’s name, design and neon sign were revealed last night during an evening of festivities. After an appearance at the annual 2019 State of the City address, Derek invited attendees to enjoy an afterparty at Downtown Las Vegas Events Center, where he promised to unveil all-new details about the upcoming project.